Oceanflow has been successful in winning Horizon 2020 SME Instrument Phase 1 support to demonstrate the feasibility of its innovative floating offshore wind foundation structure Starfloat™ and to develop a Business Plan for taking the project forward for the benefit of the EU. 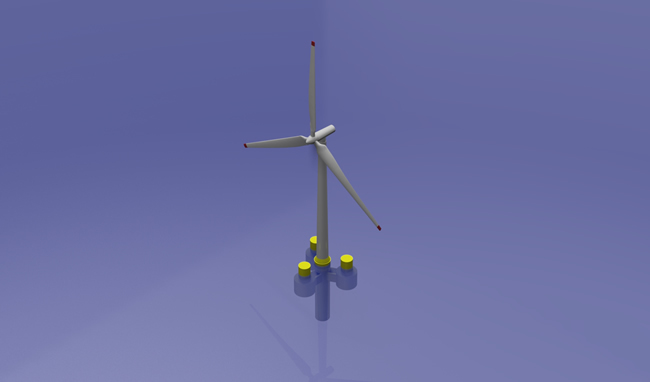 Project FLOWSPA (Floating Offshore Wind Support Platform Assembly) will demonstrate the feasibility of Starfloat’s multifloat-spar technology that provides a compact and cost effective low motion platform for supporting large capacity wind turbines at deep-water offshore wind farm sites. Energy analysts have predicted that, if a viable and cost effective technology can be delivered, the deep-water offshore wind market in Europe could meet 50% of Europe’s electricity requirement by 2050. Unlike many competitor technologies the simple scalable Starfloat™ is designed for construction at existing shipbuilding facilities with restricted water depth thus opening up construction opportunities for European shipyards. The innovative floating foundation design and assembly process takes significant cost out of the construction phase and removes the need for risky offshore marine operations. "Starfloat" has the potential to bring floating offshore wind into the same levelised cost of energy (LCOE) as fixed foundation offshore wind. The ability to exploit deeper water wind farm sites where the wind resource is stronger and more reliable using relatively low risk technology will result in reducing carbon emissions and reduced dependency for Europe on imported fuels. It also has the benefit of bringing steel fabrication work to declining shipyards and assembly work to deep-water offshore construction sites that are currently seeing a sharp decline in oil and gas related activities. "The Horizon 2020 grant will help us demonstrate the feasibility of Starfloat and, given that the competition across Europe for SME Instrument support is very intensive, winning the award is a strong endorsement of our company and its technology"